I’m bored with my hair. I’ve been growing my hair out since late 2009, and it is right below my bra strap. Pretty long. I have been thinking about donating it to Locks of Love, so I’ve been on the fence about cutting it. It’s not long enough for me to actually have hair to have after cutting off the required minimum of 10 inches, so I have to wait, and I’d be really pissed at myself if I chop it off right before it’s long enough to donate. In my opinion, that would be like quitting the race right before you crossed the finish line. It’s taken nearly two years to grow it out and nearly three years to get rid of all the bleached highlights that I had since September of 2008 (Locks of Love won’t take hair that has been bleached). That is the follicular equivalent of training for a triathlon. Except in the follicular world, instead of lifting weights and cross training, you refrain from excessive hair dye and you deep condition. I have had long hair and short, but I feel like I should inform y’all that my hair is thick, what my stylist calls “dense”, pretty coarse, and curly. To sum it up, I have a LOT of hair. And it is heavy. I occasionally (like at the moment) get headaches from the weight of it piled up on my head–I hate wearing my hair down a lot because it takes a lot of time to wrangle into submission and I hate having hair in my face, so I usually wear it in a ponytail or in a messy bun. And I have a bad habit of pulling it up while it’s soaking wet, so I have this huge wad of heavy, wet hair just chilling on the back of my head all day at work. Fabulous. Add that to the stress that my job already gives me, and no wonder I get migraines at work. So anyway, cutting it is out. So is dyeing it blonde, something that I’ve been itching to do since early early 2008, the last time that I had dyed it that color. I am currently my natural color, which I guess could be described as a medium brown with lots of natural blonde highlights and a slight tint of auburn. It’s pretty, but I am bored. In high school I dyed my hair religiously, anywhere from blonde to dark brown to reddish brown, and I cut it whenever the mood struck me. This being good thing is hard. I haven’t dyed it since June of 2009, and my hair is healthy, yes, probably the healthiest it’s been since I was like 11, but I want to do something new to it. I like the reaction you get when you do something to change up your look. And for me, dramatic is always the way to go. I am kind of thinking about dyeing it darker. I saw Kristen Stewart (I don’t like Kristen Stewart, and I haven’t seen any of the Twilight movies) with this long, black hair for some Snow White movie she’s doing, and the wheels in my head started turning. What if I dye it black? And not with permanent dye, which would ravage the hair that I’ve worked so hard to keep healthy, but with a temporary dye that washes out in 24 shampoos and is supposed to be good for my hair? I might do it. I’ve never had black hair, so I figure this is a good way to test drive it. If I like it, I’ll just keep using temporary dye until I chop this all off! I want to try this so bad!!!! I am infatuated with this stuff! I have to try it, I've heard nothing but great reviews. 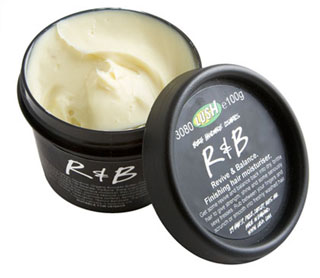 I am a self-admitted LUSH-aholic, so I am kinda biased, but I’ve read that R&B is supposed to be amazing for angry, distressed, curly hair. My hair oftentimes can get angry. It is sometimes distressed. And it most certainly is curly. I need something that can keep my hair from drying out in the harsh winters we have here in Cleveland, and I like that LUSH doesn’t use any animal products in their stuff, so even though I’m not a member of PETA or anything, I still feel like I’m doing my little bit to help the rainforests and all that. I think I’m going to buy some with my next check, and if I do, I’ll be sure to share what I think of it!